As I am having a slow week, I am feeling like doing something romantic and fantastical that I could just wander around in daydreams and fairy tales. At Andrea Rosen Gallery this weekend, I had a rather pleasant surprise from the David Altmejd exhibition. The first thing that struck me was the scale of these two Plexiglas pieces, both are enormously tall and wide with intricately woven details that seem to convey scenes from an allegorical fairy tale. The contrasting qualities of the colossal scale combined with the miniature-like details such as implementing little insects and pulling multiple strands of colored threads tightly together forming these colorful waves in motion and light movements attracted me immensely. That is to say, not only was I attracted by the swan lake (not the actual name of the piece) below but I was even more intrigued to find out that each of the bird heads is actually plaster molded hands with fingers held together that made bird-like gestures. 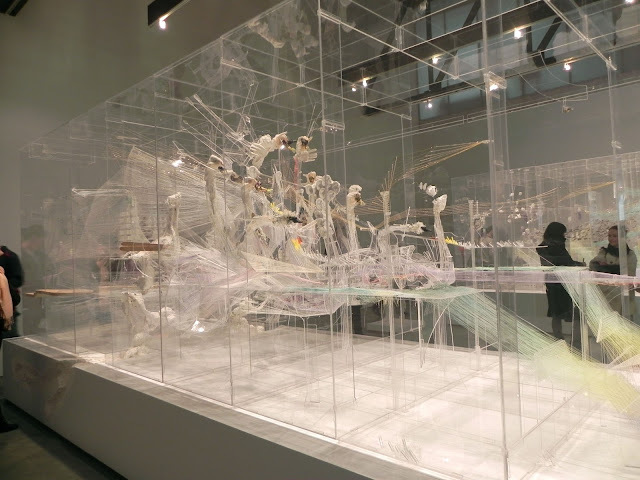 The sweeping motions of the wings in the air is entirely a visual effect that is produced from multiple pieces of pastel colored threads pulled from one end to the other. 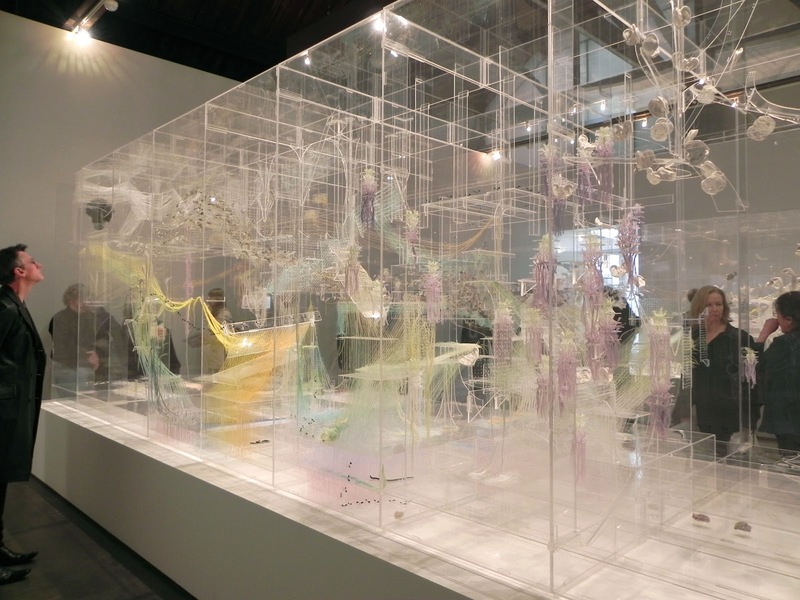 The fact that you are able to view the pieces from multiple angels through the Plexiglas also adds on another layer of narrative. In other words, when you are looking closely you get the sense of how intricately each element is physically integrated, in many ways they are like hand-made drawings done with a fine point pen. At the same time, when you step back and take in the whole sculpture, its three-dimensionality becomes alive instantly. In such a way that the narrative goes from being pure line abstraction to figuratively depicted scenes of birds, ants, and many other fair creatures. For me this piece that has been made with a sculpted head stuck on one end really reminds me of a scene from Le Sang d'un Poete by Jean Cocteau in 1930. The surrealist quality is also reinforced by the little plastic ants (such is seen in Un Chien Andalou by Luis Buñuel and Salvador Dalí in the 1920s) crawling up on all sides. 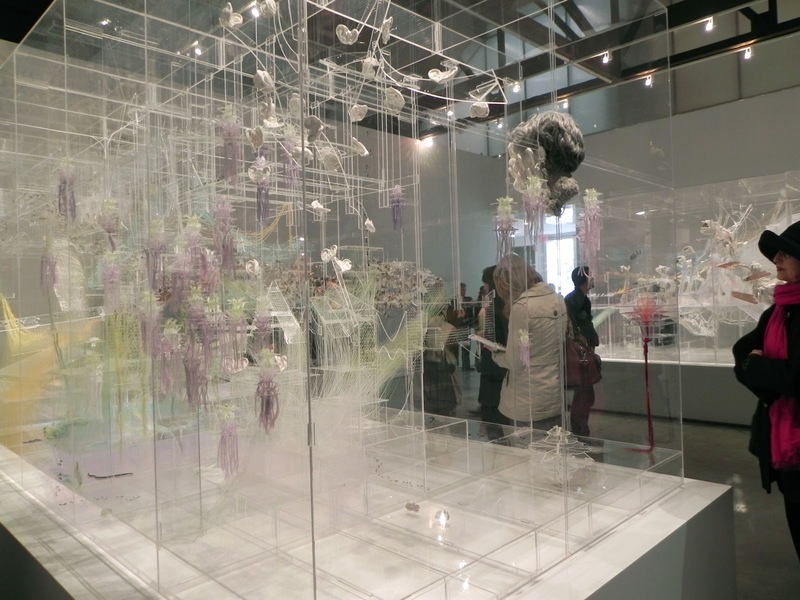 At the same time, the suspending head somehow also gives off a morbid air that is usually present in Altmejd's other more figurative works in sculpture. Veering away from his usual semi-decaying man (or animal) with glass mirrors or rock spikes glittering out from their faces of decay, these two pieces are surprisingly beautiful and optimistic, it is as if this time Altmejd is inviting us into a labyrinth of fairy tale filled with misty rainbows. But if you are also interested in seeing sculptures more in his usual style of depicting physical agony or supernatural beasts (this time rather than standing they have been integrated with the architecture and have been carved out from the plaster of the walls in the gallery), just so you can compare how soft and allegorical the aforementioned pieces are, please go to Andrea Rosen Gallery before April 23.